It’s that time again. It’s What’s On Your Workdesk Wednesday?! 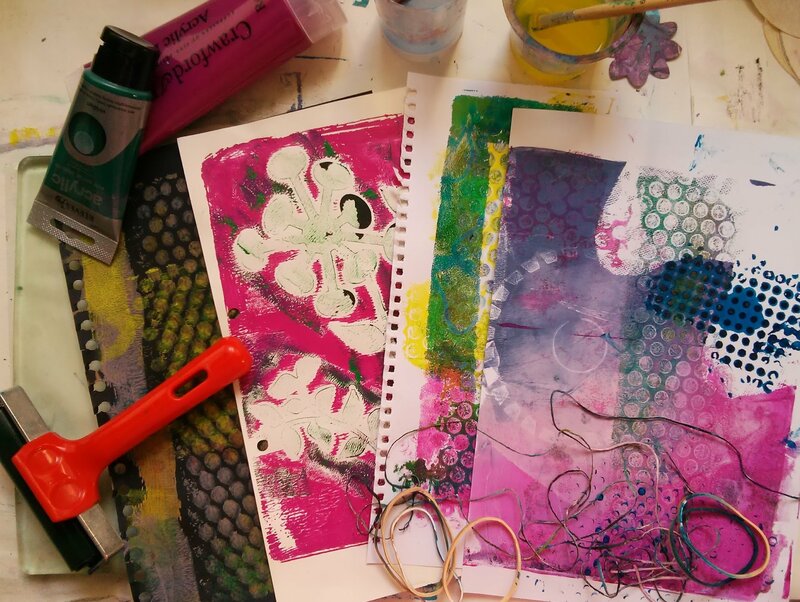 And the answer is: Gelli prints, Gelli Plate prints, and Gelli Monoprints. Ha, ha. Thought if I mixed up the names a bit I might make it sound a bit more interesting. I’m getting a bit stir crazy as I plod my way towards my 101 prints target!
. . . Returning to my Gelli Plate Monoprinting Board on my Pinterest account I found a video describing how to make a print using clear parcel tape (packing tape to those of you across The Pond)! It’s a very different approach from most of the other videos out there because it requires the paint to dry on the plate. So you’ll need a bit of patience! I found this to be much easier to do than the Mask on Gelli Print one and I’m pleased with the results. I brayered on a layer of yellow and green acrylic paint and then added various marks using an old food container lid, corrugated cardboard, a drinking straw, a cake making tool, a plastic fork and a rubber tipped tool. There were about 5 periods where I needed to stop and wait for the paint to dry before continuing. This is the final print still on the plate. Note the clear gaps. After lifting the print with the packing tape I added music, book pages, kitchen foil and gold foil to the sticky side. This is the result after lifting the paint from the Gelli Plate. I’m thinking I could make some pretty tags from these. What do you think? 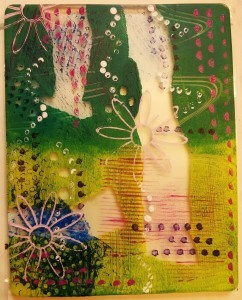 I just love working with the gelli plates. I am still trying to make up my mind about what to do with the packing tape ones. 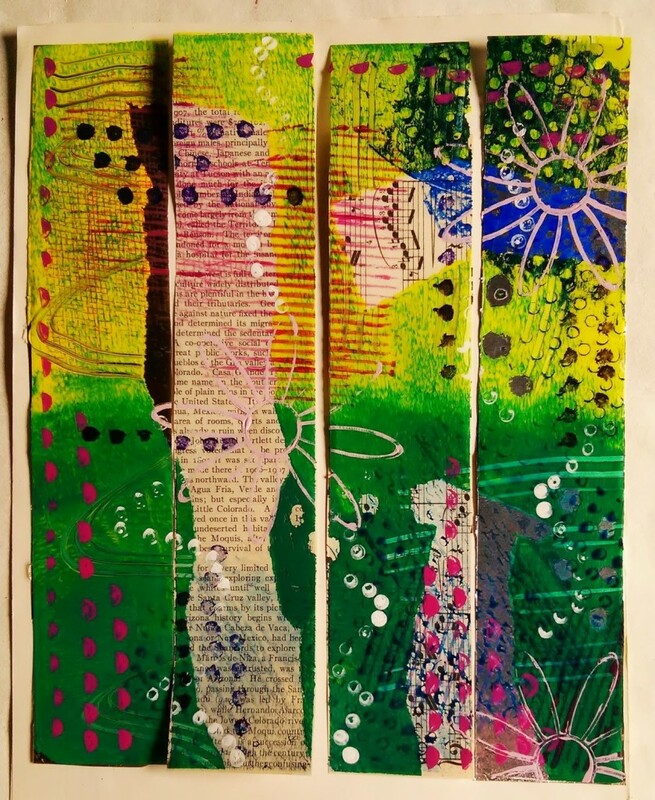 I am a mixed media artist and am trying to make them available for my art. I used some of my packing tape gellis on some of my Christmas cards last year. Not an obvious use but they looked really nice. I should have taken a pic! I think they look wonderful and would make great tags. Hi Ria. Thanks for the comment. I must admit it’s harder than I thought it was going to be to produce prints I really like. This is one that went particularly well. Feel free to follow me on the blog. I’m aiming for 101 prints trying a number of techniques. It might help you decide whether you want to get one or not. Mind you. Once I’ve got a pile of prints I’ll need to find satisfactory ways to use them. Have a fun week too. This may be the first result from gelli printing that hasnt made me think ‘oh look, more of the same’. That may be unjust, but it’s a reaction! Love the choice of colours you’ve made too, but most, I like the shiny result of this technique! What a lovely comment. Thanks Julia! I actually saw that technique on someone’s blog. I also saw you had to wait till everything was completely dry to pull the print. I don’t have a gelli, but I’ve tried pulling prints from my plexiglass plate and the results were not that good. Love what you did. Have a super slightly late WOYWW from #17. These would make amazing tags! Thanks for sharing with the party! You did a wonderful job with the transfer technique. I just watched that video yesterday and was intrigued. Thanks eveyone for your lovely comments. They’re very much appreciated!